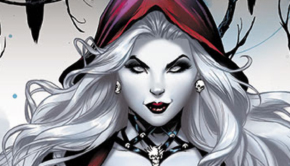 In April 2018, The CS Moore Studio will be re-releasing LADY DEATH “LA MUERTA” STATUE alongside their new LADY DEATH “LA MUERTA” AZUL EDITION STATUE which Coffin Comics offered for preorder in limited quantities at Lady Death Store a couple of weeks ago. Good news! Coffin Comics were able to secure just a few more of the AZUL EDITION statues for preorder and are now also offering the standard edition (red) statue for preorder as well! Please see the IMPORTANT ORDERING INFORMATION below for full preorder details! Brian Pulido’s signature character pays homage to the Mexican Day of the Dead celebrations in these breathtaking cold-cast porcelain sculptures by Clayburn Moore for The CS Moore Studio. 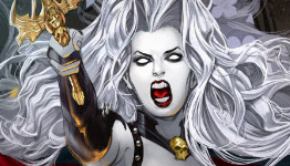 Paint design based on the Lady Death cover artwork by Richard Ortiz! Every aspect of this hauntingly beautiful, 17 1/2″ tall (with scythe*) statues have intricate details that makes each viewing a pleasure – her flowing face and back tattoos, the gorgeous hibiscus flowers in her hair, the Mexican stylized skulls and flowers on the ornate base, and the powerful staff adorned with a polished skull. 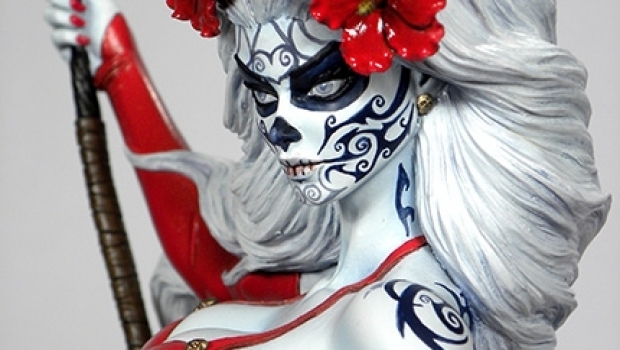 Don’t’ miss this unbelievable new Dia de Los Muertos take on Lady Death! The standard (red) statue is limited to 1,000 pieces and the Azul Edition state is limited to just 150 pieces! *The statues themselves measure approximately 13″ tall without the scythe. A non-refundable deposit of $30.00 (standard edition red statue) or $50.00 (Azul Edition statue) will be collected at the time of the transaction and will be applied towards the total purchase price, plus applicable shipping costs. When the product becomes ready to ship, the remaining balance will be billed to you. Deposits are only refundable in the event this product gets cancelled by the manufacturer. You must choose an appropriate shipping option above before adding this item to your cart. If your country does not appear in the available options, select “All Other Foreign Countries” and we’ll contact you with a shipping quote. This product will be directly shipped to you by the manufacturer once available. The ESTIMATED ship date for this product is April 2018. Please understand that production delays may occur with this product before ordering!